Baraka Books is proud to announce that both books published by its QC Fiction imprint so far this year have been named finalists for the Governor General’s Literary Award for Translation. This comes on the back of Songs for the Cold of Heart being named a finalist for the prestigious Giller Prize and builds on Katia Grubisics’s translation of Brothers, by David Clerson, being named a 2017 finalist for the Governor General’s Literary Award for Translation. 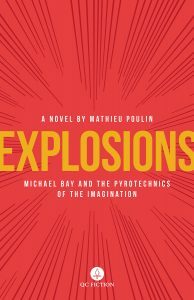 Aleshia Jensen’s first book-length translation, Mathieu Poulin’s Explosions, is an action comedy starring big-budget, explosion-happy movie director Michael Bay. What if Bad Boys was a film about decolonization? What if The Rock was about failing to be recognized by one’s peers? If Armageddon was about a post-human future and the mysteries of meaning? And Pearl Harbor a reflection on the freedom afforded an artist when transforming fact into fiction? What if Michael Bay was, against all odds, a misunderstood cinematic genius? 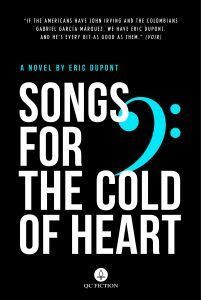 And Songs for the Cold of Heart is Peter McCambridge’s translation of Eric Dupont’s La Fiancée américaine. A yarn to rival the best of them, a big fat whopper of a tall tale that bounces around from provincial Rivière-du-Loup in 1919 to Nagasaki, 1990s Berlin, Rome, and beyond, it is the story of a century—long and glorious, stuffed full of parallels, repeating motifs, and unforgettable characters—with the passion and plotting of a modern-day Tosca. Baraka Books and QC Fiction thank the SODEC for support in funding part of these translations, the Quebec Government for its tax credit program, the Canada Book Fund for support in our publishing program, and the Canada Council for supporting our Literary Publishing Project. QC Fiction is an imprint from Baraka Books of Montreal. It brings readers of English around the world the very best of a new generation of Quebec storytellers, sharing surprising, interesting novels in flawless English translation from a new generation of translators. All questions about QC Fiction can be directed to fiction editor Peter McCambridge: qc@qcfiction.com. Baraka Books is a Quebec-based English-language book publisher specializing in creative and political non-fiction, history and historical fiction, and fiction. Progressive books with an accent on Québec.